I have recently returned from an awesome trip from Albania to Romania via Macedonia and Serbia. We took a flight to Albania and then trains (with a few buses) until we got to Romania, where we took a flight home. The Man In Seat 61 briefly describes how to travel from Albania to Macedonia, however the point of this blog post is to eleberate on this. 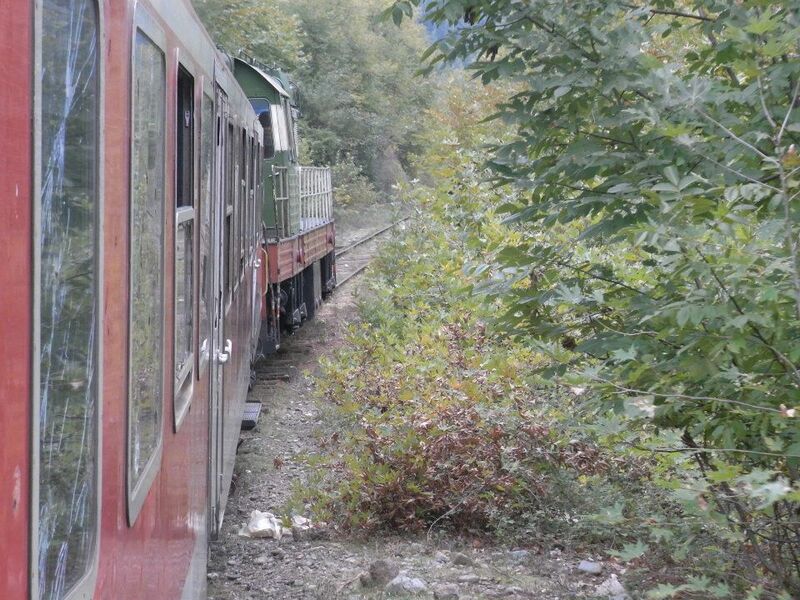 The Albania train network is fairly basic. There is a train that once a day (at 6am, at the time of writing) goes from Tiranë, the capital of Albania, to Pogradec, which is on the eastern border near Lake Ohrid. The train goes via Durrës, however, which is on the west cost, so it is not very direct. In fact, we split the journey up by going to Durrës for one day (there are many more trains that go just from Tirana to Durres – there is an 11:45 and a 14:20, for instance) and then catching the early train the next day (at 7am). It is worth noting that the trains are very, very slow. We got in around 14:30 (it is scheduled for 13:30), so it took about 7.5 hours to travel what is, as the crow flies, 55 miles – so for every hour you are on the train, you are only getting around 8 miles closer. Indeed, when the train ran along side roads, buses would easily overtake the train. I estimate it was travelling at about 20mph. The train isn’t actually uncomfortable, but they look bad. Children apparently throw rocks at the train (although we did not witness this ourselves), and so the windows have many fractures in them. However, for us at least, they were all solid and so did not let any of the cold in. When you get to Pogradec station, there isn’t much there. There is a station, a gate, and a car park area, as you can see in this photo. You will know you are approaching the station, as the line moves south on the west edge of Lake Ohrid, so there is water for a about twenty minutes before arriving. The train station is a fair distance away from the main town, as can be seen on the Google Map. Some people from the train will be picked up cars waiting for them at the station, but most people get on a kind of minibus thing, called a furgon. A lot of people pack into these things, but it isn’t completely uncomfortable. This will get you into the centre of Pogradec. I cannot recall how much I paid for the furgon, but it wasn’t too much, and even then I must have overpaid, as when I offered the driver the money he seemed very pleased by it! From Pogradec you can take a taxi to the monastery of St Naum (Sveti Naum), except it won’t be able to get you there. For about €5, however, a taxi will take you to the Macedonian border. From there, you must walk down to another border control point (it is not too far). I didn’t quite work out why there were two, but it is easy enough to navigate. From the second border point you could, if you were so inclined, look at Sveti Naum, which is rather near the crossing point. In either case, you will eventually which to get to Ohrid. There are a number of furgons which run the route between the border crossing point and Ohrid, so just jump on one of those. I cannot recall the price of this – it may have been around 500 lek each. This rather bumpy ride will take you to Ohrid bus station (which is slightly outside of Ohrid, but only a 5 minute walk). It is also possible to stop at a museum between the two points, and get back on later. However, I did not try that. I hope this has been of use to some people.